I spent the week-end walking the Yorkshire Dales. 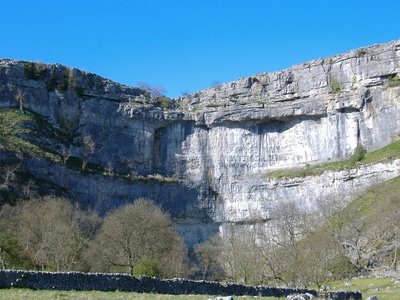 But as always my spontaneity has to be planned, and the choice of the village of Malham was no coincidence. The accommodation booked was a shrine to all things modest, a creaky guest house with a room set aside for us which resembled a starving poet's garret, and a breakfast room probably reclaimed for business from the family's off- season use. Photos of the kids and battered board games strewn around were obvious reminders of a recent end to a long, lean winter. But the setting was ideal, right in the middle of Malhamdale's two must see locations. On arrival I hardly had the time or inclination to consider how beautiful the setting was. I was too busy making a hash of parking the car in the narrowest of gaps set aside for residents, allowing my pristine rear bumper to make a sickening thud on to the jagged protrusions from the Yorkshire building's walls. And sweat-hefting bags, bottles of wine, back packs, and about half a ton of clothes, delicately draped over spindly hangars, up a succession of staircases so narrow anyone wider than a snooker cue ran the risk of fat man's wedge and so steep I thought I was ascending the sheer face of Malham Cove. There I go, name dropping already. Our first walk was indeed to Malham Cove. On one of the hottest days of this year we set off to find the cove. Uphill all the way, this was to be one walk that was more challenging than the guest house stairs. The cove at 80 metres high and 300 metres wide resembles a cliff face. Mere mortals are generally happy to have got there and to stand beneath it making cooing noises at its height and majesty, and admire the peregrine falcons wheeling around as if magnetized by the whiteness of the face. Others cling to it with sucker hands and feet and invisible lines which may or may not save their lives should they lose their grips or footings. Sooty markings seem to scour the grey-whiteness which apparently prompted Charles Kingsley to suggest that a chimney sweep might have thrown himself off the top whilst fully blacked and brushed leaving behind a sooty trail as he tumbled downwards. Kingsley was a fan of this area, hanging out around the cove and Malham Tarn dreaming up the early drafts of The Water Babies. I found myself wishing that he'd flung himself from the cove - chimney sweep style - before writing the book, which would have saved me from reading this near unreadable book to my children. Leaving the human flys to their sport, or fate, dangling like puppets but obviously in robust spirits cracking climbing-themed jokes to each other which echoed for miles, we took the track to the top. Giving the drop a healthy berth, we picked our way along the limestone pavement as if playing an exaggerated game of mind the cracks, carefully avoiding the deep clints and grykes in the surface which looked like a giant's concrete path that had been smashed, with teeth gritting vigour, with a huge sledge hammer. We circled around clipping bits of the Pennine Way here and there - carefully avoiding all signs to the Gordale Scar which was to be our next walk. I was beginning to wonder how author Bill Bryson stayed a tub of lard all the time he lived around here, after all, he did like a walk, did Bill. But then, if like me he repaired to any one of the two delightful pubs in the village at the end of each climb or ramble, and re-hydrated with pints of Old Peculiar and re-energised with huge plates of wholesome Yorkshire food, he's forgiven. I came to The Apprentice late. But I've been watching it for long enough. Long enough to feel great pleasure watching that plump chump, red coat, Paul Tulip get nailed last night after his first boardroom face to face with Sir Alan Sugar. When I first saw this guy - during the flight advertisement episode - I thought he was in his mid thirties. He then seemed to get progressively younger as the episodes rolled on, late twenties, mid twenties, early twenties. If he had stayed any longer - you have might have been excused for thinking he'd have been Buntering around with a school cap on his head and a catapult hanging from his shorts by the last task, before demonstrating a bandy-legged, milky stained romper suit totter and a face full of mashy rusks for the interview stages. Week after week he escaped the mauling he so deserved, by either sneaking through on the winning team, or drawing on his blokish, cheeky chap chipperese to win over undiscerning punters and steal yet another dubious win and the shield it gave him from scrutiny. The chinks were there, but the format bailed him out again and again. Full of pompous nonsense about being the best candidate in the programme, the house, the world, it was quite plain to me that he was seriously deluded, but all those 'wins' fuelled that delusion and somehow actually made him favourite to be hired. By the time our Paul had been structure interviewed by Sir A's trusted henchmen he was exposed - not before time - as a shallow chancer. Once these facts were reported back to the straight talking no-nonsene Sir A, he could hardly wait to send him packing. And he went with barely a whimper.